Ritchie Bros. looks like its hitting on all cylinders, but here are three things to watch out for — just in case. 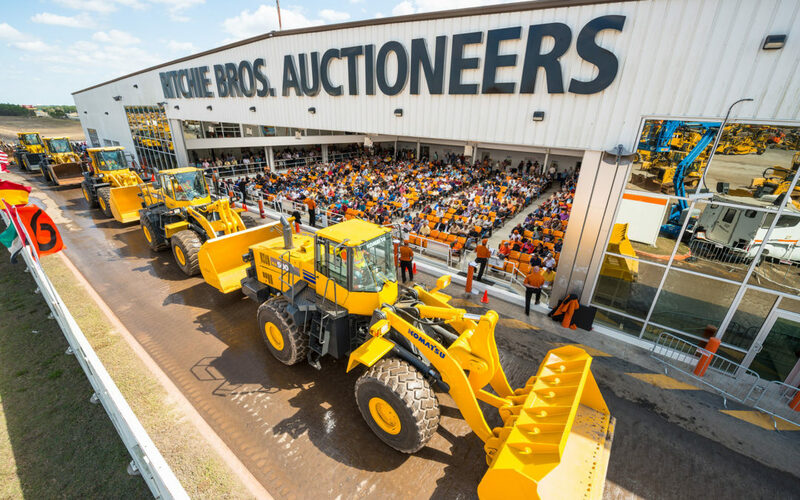 Ritchie Bros. Auctioneers (NYSE:RBA) is the world’s largest auctioneer of heavy equipment, with auction sites around the world. Selling used gear has been a good business lately, with Ritchie’s top line heading higher each year since the end of the recession. But before you get too excited, here are three of the biggest challenges facing Ritchie Bros. today. Perhaps one of the most impressive things about Ritchie Bros. is that nearly half of purchases are made by bidders outside of the region of its auctions. These bids are coming from the company’s Internet sites. So, in many ways, Ritchie Bros. is well versed in technology. But the company has been around since 1958, and some of its internal systems haven’t kept up with the times. In fact, the company’s strategic road map includes the item “Modernize legacy systems.” It’s using Salesforce.com (NYSE:CRM) as a “unifying platform” as it expands. Investing in the core systems to support growth is a good move, but there are risks that the transition won’t work as smoothly as planned. And, perhaps more notable for the top and bottom line, there are costs associated with this. For example, CFO Sharon R. Driscoll explained during the fourth-quarter conference call that, “Related to our recent IT initiatives in the fourth quarter approximately $1 million of expense items are associated with software license fees, for new CRM tools, that have been deployed and are now operational. These are new expenses, and are aligned with our commitment to strengthening our IT platform.” And that’s assuming everything continues to go smoothly. If the transition to new technology doesn’t go as planned, day-to-day operations could be disrupted, hampering results and adding even more costs to the picture, as the company tries to fix the mess. It’s the right move to make, but it’s also more expensive for the business on an ongoing basis. You don’t need to be hugely concerned, but technology changes can be trouble spots. At the very least, Ritchie Bros. is looking at higher costs. The bulk of Ritchie Bros. business is structured as simple auctions. It just gets a percentage of the sales price for doing the auctioning. However, the company also handles what it calls “at risk” auctions. In these situations, the auctioneer guarantees the seller a price for its equipment regardless of the final outcome of the auction. Although this results in higher commissions for Ritche Bros., it also means there’s a chance of taking a loss, too. “At risk” sales, which are also known as underwritten transactions, made up about 30% of the company’s revenue in 2014 and 2015. That’s been a roughly consistent figure for that last few years, with numbers as low as 24% in 2010 and reaching into the low 30% area a few times. However, that means that somewhere between a quarter and a third of its revenue could become problematic if used equipment auction sales don’t live up to expectations. Again, it’s not something to be overly concerned about. Ritchie Bros. has an extensive database of completed auctions to use as benchmarks as it inks “at risk” deals. But it is something to keep in the back of your mind, because a swift drop in the prices customers were willing to pay for used equipment could quickly explain why the word “risk” is used to describe this side of the business. So keep an eye on this segment of the pie to make sure margins don’t suddenly start shrinking, as that could be a warning sign of potential trouble. 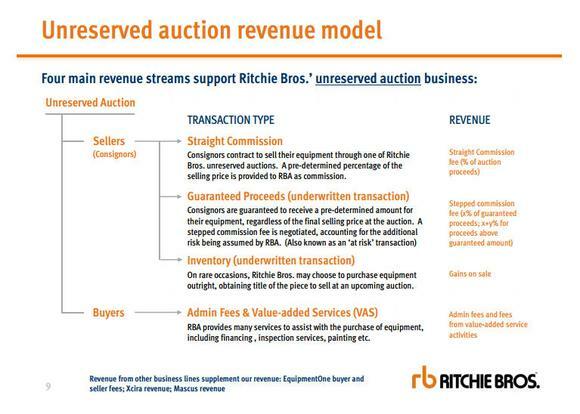 There’s always going to be stuff to auction, so it’s highly unlikely that Ritchie Bros. hits a period where it just has nothing to sell. However, the world has been in something of a funk since the deep recession. Some of the negatives include a still-recovering U.S. housing market, declining growth in China, and global weakness in the oil patch. But all of these are really positives for Ritchie Bros. because it increases the likelihood that they’ll see more equipment sold at auction. So, right now, this auction house has been operating in a pretty good environment, at least for its business. But what happens if the world goes into a robust growth phase? Sure, investors appear far more concerned that we’re heading for a downturn than an upturn today. But you should still be thinking about what would happen to Ritchie Bros. if robust good times arrive. The problem for Ritchie Bros. is that, as a middle man, it has no control over how much equipment is available, the age and quality of that equipment, or how much demand there is from buyers. And since many of the industries it deals with are subject to boom and bust cycles, there’s some complicated dynamics going on. For example, in good times demand for equipment may be so robust in some industries that there’s virtually no equipment available for auction because it’s all being put to work. At other times, say after a series of large projects have been completed or a major company is refreshing its fleet, there could be a flood of equipment. If there’s solid demand at that point, the prices Ritchie Bros. fetches will be good and there’s no problem. But if demand is weak, the prices could be less desirable and the auctioneer won’t do as well. So while a strong global economy will likely result in good things for Ritchie at first, it could lead to a spell of stagnant results if the auction market starts to slow down. But you’ll need to watch the underlying trends, to get a feel for how Ritchie Bros. is faring. Keep an eye on things like the supply of used gear, equipment age, and auction prices–all of which Ritchie discusses regularly. Now, based on Ritchie Bros. Auctioneering’s global presence and leadership position in the industry, that could be a temporary setback that leads to a buying opportunity for investors. But don’t dismiss this big-picture problem just because times are good (for Ritchie Bros.) today. No investment is perfect, so you have to accept a few warts when you buy any company’s shares. But that doesn’t mean you shouldn’t think about the negatives, even if you are willing to accept them. For Ritchie Bros., the three biggest challenges it faces aren’t all that daunting today. But problems with technology upgrades and the ongoing costs associated with them could be a lingering issue that drags results down. The company’s “at risk” business is a net positive today, but it could turn into a negative if the market for used gear slows and margins compress. And while there’s plenty of stuff to auction right now, what would happen if the used inventory dried up in a global economic upturn? Don’t dismiss this auctioneer because of any of these potential problems, but don’t ignore them, either. I don’t know about you, but I always pay attention when one of the best growth investors in the world gives me a stock tip. Motley Fool co-founder David Gardner (whose growth-stock newsletter was the best performing in the world as reported by The Wall Street Journal)* and his brother, Motley Fool CEO Tom Gardner, just revealed two brand new stock recommendations. Together, they’vetripled the stock market’s return over the last 13 years. And while timing isn’t everything, the history of Tom and David’s stock picks shows that it pays to get in early on their ideas. Reuben Brewer has no position in any stocks mentioned. The Motley Fool recommends Salesforce.com. Try any of our Foolish newsletter services free for 30 days. We Fools may not all hold the same opinions, but we all believe that considering a diverse range of insights makes us better investors. The Motley Fool has a disclosure policy.